Born in a village near Kotaliparha at Faridpur district at what is now Bangladesh in 1939. The family moved to Calcutta in 1947 following the Partition of Bengal. Chowdhury entered the Government College of Art and Crafts in 1955 and graduated from the college in 1960. Chowdhury's first job was as an art teacher in a school in Howrah. He taught there for two years and then in 1962, he joined as a textile designer in the Handloom Board. In 1965, Chowdhury went to Paris and studied in Ecole des Beaux Arts and in William Hayter's Atelier 17. He returned to Indian in early 1968 and went to Madras as a textile designer in the Handloom Board. He stayed there for four years till 1972. 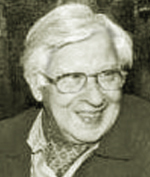 His first book of poems was published in 1970. The same year he joined the Calcutta Painters Group. Chowdhury moved to Delhi in 1972 as the curator of the art collection at Rashtrapati Bhawan. 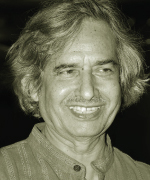 In 1975, he along with some leading Delhi artists founded Gallery 26 and Artists' Forum. From 1976, onwards, Chowdhury participated in several exhibitions and art camps abroad. He published a joumal called Art Today in 1981 with Shuvaprasanna. In 1987, Chowdhury joined Kala Bhavan, Santiniketan as professor of painting. 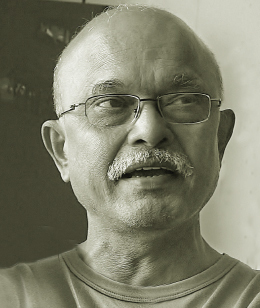 Besides his numerous activities, Chowdhury has written extensively on contemporary art. Always a powerful artist, Chowdhury developed his individual style after his return from France in the late '60s. Although Chowdhury has painted oils, his forte is painting in ink, water colour and pastel. The sinuous line contouring the flaccid figures, the crosshatching to achieve tonal variations distinguish Chowdhury's paintings which show men and women in enigmatic situations with provocative gestures placed in a dark dream-space. There is a bit of the theatre of the absurd. Chowdhury lives and works in Santiniketan and Kolkata. Born in Lyallpur (now Faislabad, Pakistan), in pre partition India in 1925, Krishen Khanna moved to Shimla during the partition. In Lahore, Khanna had attended evening classes at the Mayo School of Art. After arriving in India he took up a post with the Grindlays Bank and was placed in Mumbai. Once there Khanna was invited to join the Progressive Artists' Group with whom he remained in active association for the rest of his time. In Mumbai he held his first major exhibition and sold his first painting to Dr. Homi Bhaba for the Tata Institute of Fundamental Research. Khanna was awarded the Rockefeller Fellowship in 1962 and was Artist in Residence at the American University in Washington in 1963-64. Apart from several one man shows, he has participated in group shows like the Tokyo Biennale 1957 and 1961, the Sao Paulo Biennale 1960, the Venice Biennale 1962, the Festival of India in the then USSR and in Japan in 1987 and 1988. Khanna has held several important positions in decision-making bodies of the Lalit Kala Akademi, National Gallery of Modern Art and Roopanker Museum, Bhopal. He was awarded the Padma Shri in 1996. Making a gestural impact on the canvas Khanna's masterful deployment of paint to evoke the human situation is unmatched. The thick impasto surface often seems like a prism through which figures can be discerned as if in memory or in remote areas of childhood. Khanna lives and works in New Delhi. Born in 1946 at Nerur Par, Maharashtra . He was trained at the J.J.School of Art where he spent the best part of 20 years as a teacher. During his formative years, he worked under Shankar Paliskar. The early work of Prabhakar Kolte shows the strong influence of Paul Klee, the Swiss artist and teacher whose childlike figures belie the sophistication of his richly textured surfaces. Kolte’s debt to Klee can be seen in his technique of weathering his stronger colors, adding touches of white to age the effect of an otherwise bold hue. In the early 80s, his work took a new direction as Kolte began experimenting with installation and performative art pieces. In one piece, he covered a car with newspaper; in another, he painted a volunteer black and titled him “A Man Without Shadow”. On returning to the canvas, he sought to “immediately cover up any identifiable image, making sure that my forms would function as pure colour in space.” His most recent works show a glossier, more finished approach to his early themes in paintings. The strong ground colour remains, but this time both it and the forms overlaid onto it retain a crispness in line and colour: the “weathering” inherited from Klee has dropped out in favor of more finished - and thus more abstracted - fields of colour. He has held many solo shows across the country and aborad and participated in group shows including Contemporary Art in Maharashtra, 1975; VI International Triennale, Lalit Kala Akademi; I National Bharat Bhavan Biennale, Bhopal in 1986; Six Indian Painters, Yugoslavia, Ankara & Istanbul in 1985; Contemporary Artists from SAARC countries, NGMA, 1992; Three Artists, Hong Kong, 1995; Galerie Foundation for Indian Artists, Amsterdam, 1996; Modern Indian Art, New York, 2001; Tatva The Elements, London, 2006. In 2001 his solo show was organised by Galerie Mueller & Plate in Germany. He lives and works in Mumbai.